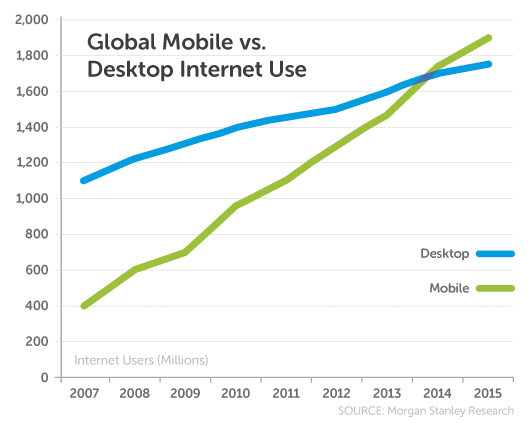 “Mobile to overtake fixed Internet access by 2014” was the bold prediction made in 2008 by Mary Meeker, a technology trend analyst at Kleiner Perkins Caufield Byers. Did it happen? You bet it did, and right on track! In fact, we’re now past the mobile tipping point, so it’s no longer a case of asking whether marketing to a mobile user is important, we know it is. So what does this mean for nonprofit websites that are not optimized for mobile traffic? Not having a mobile web presence could mean your company is behind the times. And that’s not good. For starters, more than half of your new visitors — to be specific, smartphones users — are going to see an all-too-familiar, old-school website that is too small to read, and very difficult to navigate. To make matters worse, these users are NOT going to stick around to find the content they’re interested in. Your non-mobile website is too much work for the mobile user, and its mere presence could alienate the early adapters/modern users you want to attract and cultivate. So does this mean you need to develop separate websites based on the devices used by your visitors? Five years ago, the answer was “probably”. But in 2015, not on your life! Creating just a single website, optimized for all devices, is a recent movement in the web development world. That web movement is Responsive Web Design. You may have noticed some of your favorite daily media websites have gone through a design upgrade lately. (Okay, maybe you haven’t noticed, but trust me — most of them have!) Maybe content appears larger, easier to read, and just looks great overall. There’s a good chance a responsive upgrade is behind the improvements. Some responsive websites that I visit regularly are: Vox, The NYTimes’ “The Upshot”, New York Magazine, Consumerist, and let’s not forget the newly responsive Rumohr and Clarke, designed and developed by yours truly. Check one of them out. If you’re on a desktop or laptop, resize your browser from large to small and back — see how everything resizes and realigns to display correctly in the width of your browser? That’s responsive at work. Visit these sites on your smartphone or tablet and content will be also be sized accordingly. Don’t despair if responsive design seems daunting. Any modern web designer/developer worth his or her salt is well acquainted with it. An upgrade to responsive will provide your nonprofit with an exciting new website capable of delivering engaging, attractive and navigable content across all devices for donors and other members of your community. For more information about responsive design services at Rumohr and Clarke, click here. Get fast relief for your tired, achy website! We are excited to announce website design and development as a new service area at Rumohr and Clarke. A new, modern website is now within reach of nonprofits with modest budgets and time constraints. 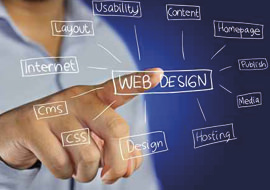 Our business model and web development process keep costs low while delivering a superior online web presence. Whether your website simply needs a fresh look, added mobile functionality or a complete overhaul that optimizes the user experience, we’re here to help. Web wizard, Stephen Rainforth, will lead a process that gets you up and running in as little as two weeks, depending on your needs and goals. Modern design, integrated donor management, mobile responsiveness across multiple platforms, and ease of navigation will leave you and your community with an online experience that reflects your vision and mission. Check out his recent nonprofit projects for yourself at Love Heals and Apple Arts, and also visit our brand new Rumohr and Clarke website. Email us or call us at (646) 926-0562.